Bakeries and little cafes are my favorite genre of food places. I spend lots of time sitting around in them - meeting friends or writing on my own. There is something fascinating about these pretty cake vitrines, small tables, coffee and this special noise, which is always around there, calming me down and magically getting my thoughts into order. If you are an expat in Moscow, plan travelling to Moscow or simply live in Moscow, here’s are the cafes and bakeries that might be of interest to you. 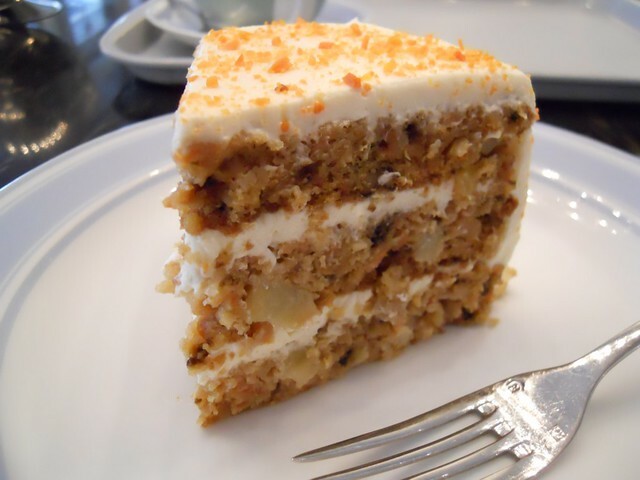 Upside down cake is a brilliant bakery with British pastry chef. I'm crazy about their mini cup cakes (especially the one with green tea and the 'French toast'). Spongy milky cake and vanilla and banana trifle are also incredible. The place is perfect for a relaxed talk out. I also like coming on the weekend if I feel like blogging out (the free wifi is so much to the point!). Next time I'm going to try their hot chocolate with home made marshmallow. Here is my post about Upside down cake. I love cake is an American bakery with amazing choice of fresh and beautiful cakes, tiramisu variations, brownies, cookies and delicious flavored milk drinks. Everything is very sweet even for me, but still irresistible. The place was recently opened by the owners and pastry chef of Friends forever cafe. I do like Friends forever as well, especially for its interior and long list of delicious soups. Paul bakery is a European chain of French bakeries and their first location in Moscow opened just recently. As you enter it feels exactly like somewhere in Western Europe. While in France I didn't appreciate Paul, because there were too many small unchained family bakeries around. But here it felt like being back to France. All of my favorite classic pastries (pain au chocolat aux amandes, palmier, eclaires, macarons etc) are there and taste quite good. Orloffsky hleb (Орлоffский хлеб) is a French bakery I recently found on Novy Arbat. Their almond croissant is the best I tried in Moscow so far. Cherry and almond roll is another piece of pastry definitely worth trying. Fresh bread also looks quite good, but I haven't tried it yet. It is nice to come for a cup of tea or just take some pastry away in a nice paper bag. Here is my post about Orloffsky hleb. Volkonsky is a French bakery which has makes classic French bread and pastry pieces (almond croissants, pain aux raisins, pain au chocolat etc.). 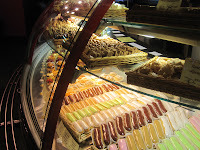 They also make macarons, millefeuille, tarte tatin and other pretty confectionaries. 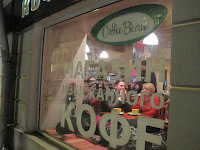 I like visiting their Moroseyka branch to meet a friend, have a cider or a tea with an almond croissant. They also have tasty salads and pastas for those not tempted by the sweets. Creperie de Paris cafe has been my place for emotional meetings for the last several years. It's a quiet and comfortable French creperie. Start from a bottle of cider brut. If you're cold, surely try their onion soup or curry-marrone cream soup. Pick a savory galette with a beautiful appetizer or main course inside. Now pick a sweet crepe or a gofre with berries & cream or pine apple flambe or sweet almond cream. Or forget about crepes and try cheesecake a la Serge. I'm sure you will enjoy. My favorite branch used to be right next to Mayakovskaya mrt, but I just found it's now closed, so pick another one. ArtLebedev cafe I love for their simple and friendly atmosphere. It is one of those places where you are welcome to spend hours and hours with your book or laptop. The coffee will always be good, the food and desserts - very fresh, wifi free and staff - attentive and considerate. Le pain quotidien is an international chain of bakeries originating from Brussels. Every time I come it surprises me with how beautiful their food is. Their soups, appetizers and salads are so crispy fresh. Everything is served with fresh Italian bread and butter. Umm... If you come, definitely do try their cappuccino. Here is my post about Le pain quotidien. Coffee bean cafe is a small chain of coffee shops. I love them for their fun baristas, warm cheese and apple cobbler with vanilla sauce and the milk foam on mega-capuccino with cinnamon. The inside buzz is absolutely therapeutic for those having hard times. One can spend hours and hours in Pokrovra street branch with its free wifi. If you don't need wifi, there is nothing better than sitting in a frame of one of Pyatnitskaya street Coffee bean large windows. Here is my post about Coffee bean. 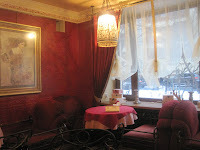 Gogol-Mogol cafe is something I found just recently. It's really pretty and relaxing inside. Even to go through their menu is already a great pleasure. Desserts feel dainty, teas are delicious and warming. Next time I'd love to try their crepes and varenyky with cherries and sour cream. Here is my post about Gogol-Mogol. Vienna strudel cafe I visit for a classic apple or cherry strudel with vanilla sauce. Perfect to meet a friend for a quiet talk. They make strudels with every possible filling, so you're probably to find one you'll like. Surprisingly moderate in its prices. Beard papa's - Japanese bakery making perfect cream puffs (profiteroles filled with vanilla custard). Cinnabon - American bakery making amazing cinnamon roll buns.